Researchers Test Aerobics Against Resistance Training for Fat Burning. 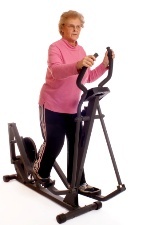 Aerobic exercise, a new study has confirmed, is the best way we can burn fat. Compared to resistance weight training, cycling, walking, and other aerobic activities do a better job of reducing fat. The study included 234 overweight or obese adults who were placed into three separate exercise groups. The resistance training group did three days a week of weight lifting, three sets of 10 repetitions each day. The aerobic exercise group jogged the equivalent of 12 miles per week. The combination group did both regimens. The results showed that people doing aerobic fitness or the combination lost more weight than those who were just lifting weights. In fact, the resistance group put on pounds because their lean body mass increased—muscle weighs more than fat. The people who shed pounds spent an average 130 minutes a week of aerobic exercise. The people on resistance training spent more time, 180 minutes a week, and did not lose weight. The combination group had the greatest time commitment, but did not lose significantly more weight than the aerobic-only group. Of course, no one specific exercise delivers all health benefits. It makes sense to use a number of different activities to stay healthy and disease-free. But, if your primary objective is to lose as many pounds as possible, aerobic exercise is probably the best place to start. Willis, L., et al., “Effects of aerobic and/or resistance training on body mass and fat mass in overweight or obese adults,” Journal of Applied Physiology 2012; 113(12).